We’d love your help. Let us know what’s wrong with this preview of The Spanish Anarchists by Murray Bookchin. The seminal history of Spanish anarchism: from its earliest inception to the organizations that claimed over two million members on the eve of the 1936 Revolution. Hailed as a masterpiece, it includes a new prefatory essay by the author. "I've read The Spanish Anarchists with the excitement of learning something new. It's solidly researched, lucidly written, and admirably f The seminal history of Spanish anarchism: from its earliest inception to the organizations that claimed over two million members on the eve of the 1936 Revolution. Hailed as a masterpiece, it includes a new prefatory essay by the author. Murray Bookchin has written widely on politics, history, and ecology. His books To Remember Spain: The Anarchist And Syndicalist Revolution Of 1936, The Ecology of Freedom, Post-Scarcity-Anarchism, The Ecology of Freedom, and Social Anarchism or Lifestyle Anarchism: An Unbridgeable Chasm—are all published by AK Press. To ask other readers questions about The Spanish Anarchists, please sign up. Bookchin argued, in one of the earlier histories of the Spanish Revolution, that it took nearly 3 generations of struggle, organization building, and conflict to lead up to the strong revolutionary change that characterized the Revolution and Civil War. The book is therefore the story of building the revolutionary organizations that led to the founding and development of the anarchosyndicalist union in the CNT and specifically anarchist activist organization in the FAI. Bookchin notes that Anarc Bookchin argued, in one of the earlier histories of the Spanish Revolution, that it took nearly 3 generations of struggle, organization building, and conflict to lead up to the strong revolutionary change that characterized the Revolution and Civil War. The book is therefore the story of building the revolutionary organizations that led to the founding and development of the anarchosyndicalist union in the CNT and specifically anarchist activist organization in the FAI. Bookchin notes that Anarchism and similar socialist movements took root in Spain very early on as a result of the extreme measures of the Spanish ruling classes, along with the heavy village communal traditions. He frames Spanish Anarchists having developed through periods of building unions, before drifting towards terrorism as a response to repression, such as assassinating politicians and military officials. By the 20th century, it had been generally accepted that multiple tactics should be embraced, including direct action, propaganda, general strikes, and dogged union organizing. The founding of the CNT in 1911, enabled a larger union movement to arise in Aragon, Catalonia, southern Spain, and beyond. By the 1920s-30s, several right-wing military coups led to repression of leftist movement but rapid growth of the CNT and the creation of the more secretive FAI. All of this built towards the eventual showdown in 1936, when again a right-wing general in Franco attempted to nullify an election, but this time, the people of the country stood up and said no, ushering in the Revolution in Barcelona and the countryside in the shadow of the Republican cause that began the Civil War. -Anarchism in Spain came from utter poverty and rigid class societies, which lead to Spanish Anarchists carrying a disdain for pleasures of the flesh, a responsibility of all to work, and duty towards revolution. Spanish revolutionaries also carried an inherent distrust of authority. -Tensions between the Anarchists of the rural peasantry and the urban unionists led to different traditions which eventually worked together in alliance, but still led to heavy debates, such as national organization versus local, communes versus dividing the land into individual plots, libertarian communism versus Bakunin’s collectivism, and more. So, what's all the hubaloo about anarchism in Spain anyhow? Well, probably the best stop to find out the details is here: The best history of anarchism up until 1936 in Spain that I know of. Why is anarchism in Spain at all relevant? Well, according to Noam Chomsky, the Catalan part of Spain could have been the most progressive society (albeit very briefly) in world history when the anarchists had popular control of government there. A must read of history that is ignored by most mainstream hist So, what's all the hubaloo about anarchism in Spain anyhow? Well, probably the best stop to find out the details is here: The best history of anarchism up until 1936 in Spain that I know of. A must read of history that is ignored by most mainstream historians who brush off the history of anarchism at their own peril. Whether one is anarchist or not, it is impossible to realistically understand modern Spanish (or world) history without understanding the importance of the role of anarchism. The first point to mention: One's understanding of what happened in Spain is almost certainly indicated by the answer to one question. Was this the Spanish Civil War or the Spanish Revolution? The essence of Bookchin's book (and it is not original to him) is that there was a revolution within the Civil War. While there is considerable recognition of the Civil War, there is much less discussion and consideration of the revolution within that civil war. One immediate problem in understanding the d The first point to mention: One's understanding of what happened in Spain is almost certainly indicated by the answer to one question. Was this the Spanish Civil War or the Spanish Revolution? The essence of Bookchin's book (and it is not original to him) is that there was a revolution within the Civil War. While there is considerable recognition of the Civil War, there is much less discussion and consideration of the revolution within that civil war. One immediate problem in understanding the dynamics in Spain is the crazy quilt set of actors. Key groups run the gamut from Fascists (Francisco Franco as a leader) to monarchists to liberals/moderates to Marxists (Trotskyites, represented by the organization POUM, versus Stalinists, organized as the UGT [with members called Ugetistas:]) and anarchists (syndicalists, members of the union CNT, whose members were called Cenetistas, and straight out anarchists, members in the organization FAI, with individual members referred to as Faistas). Yikes! One needs a scorecard to keep them straight! This book does not focus on the Civil War and Revolution so much as on the background to those events. Bookchin goes back to the anarchist Mikhail Bakunin's influence on Spanish radicals. Much of this book is the run up to the Civil War and the revolution embedded within that Civil War--the Republic versus the Fascists represented the Civil War. The anarchists trying to implement libertarian societies was the revolution. Topically, the book begins with the origins of the idea of anarchism in Spain. Bakunin was a critical figure here, a Russian aristocrat who, oddly enough, adopted the anarchist perspective. An emissary who did not speak Spanish brought Bakunin's ideas to Spain; given the linguistic obstacles, it is surprising indeed to see that he had an impact on the development of a Spanish anarchist movement. The book then describes the development of that movement in Spain over the past quarter century of the 1800s and the early 1900s as well. In short, anarchism did develop something of a foothold in Spain. Unfortunately, some of the advocated if this view engaged in "propaganda of the deed," terrorism, to try to advance the cause. In the process, much damage was done to that very movement. Bookchin then described the twin developments--support for anarcho-syndicalism (a perspective that argued that workers' organizations ought to structure the productive process and be the basis for organizing society) and the CNT (a union that supported syndicalism). The essence of the latter can be discerned by this quotation from Bookchin (page 162): "Obedience to the wishes of the membership was a cardinal rule. At the annual congresses, for example, many delegations arrived with mandatory instructions on how to vote on each major issue to be considered. If an action was decided upon, none of the delegations which disagreed with it or felt it was beyond the capacity of its membership was obliged to abide by the decision." The instability of government in the 1920s and 1930s is then discussed, as a lead up to the outbreak of the Civil War/Revolution. Bookchin concludes by observing that (page 302): "We must leave the details of that revolution--its astonishing achievements and its tragic subversion--to another volume." Obviously, Bookchin has an ideological perspective on the events in Spain over the period of time that his book covers. And that must be taken into account when reading this work. Nonetheless, overall, his scholarship is solid, and much of what he contends is found in other volumes as well (hence, triangulation occurs to some extent). For those wanting to understand the Spanish Civil War from a perspective not normally presented, this book makes a solid contribution. While errounsly I thought the book was going to about THE REVOLUTION itself, I read it anyway and this much to my liking. Bookchin ends the book with the quote above, pointing out that those celebrated social structures (for some the only proof that an industrial society can be organized in anarchistic fashion) don't come into being by some magic spontaneity, but by the hard work of forming a movement, a counterculture. A fascinating history of one of the most important anarchist and syndicalist movements in history. This book offers a very important perspective that is vital in understanding the social, political, and ultimately human context that lead to the development of the Spanish Revolution, and the inextricably linked Spanish Civil War of 1936-1939; at the same time giving us a plethora of further reading that I intend to do. Bookchin does a wonderful job in explaining the dynamics, organization, and evo A fascinating history of one of the most important anarchist and syndicalist movements in history. This book offers a very important perspective that is vital in understanding the social, political, and ultimately human context that lead to the development of the Spanish Revolution, and the inextricably linked Spanish Civil War of 1936-1939; at the same time giving us a plethora of further reading that I intend to do. Bookchin does a wonderful job in explaining the dynamics, organization, and evolution of the movement. Important to note is the fact that the tendency within syndacalism to bureaucratize, as happened in France, was off-put by a constant influx of rural workers into industrialized cities (pages 60-61). Furthermore this book raises a lot of important questions, and points out many difficulties that such a movement have to answer respectively overcome when trying to grow in influence. - the contradictions faced by the anarcho-syndicalist movement when they were faced with the problem of voting for a "lesser evil" in an attempt to curtail the rise of fascism (p. 259). Their mistake beautifully summed up with the phrase: "one must emphasize that it would have been preposterous to expect a "lesser evil" to behave with noble virtue." (p. 261), offering a very sobering view on how radical movements should treat electoral politics. - Murray Bookchin meticulously explains the tensions, and dynamics that existed between the two allied factions whose synthesis gave rise to anarcho-syndicalism: the FAI (Federación Anarquista Ibérica), and the CNT (Confederación Nacional del Trabajo). How their evolution impacted each other and ultimately an exposition of the differences in temperament, organization, and scope. All scattered throughout the book, with important emphasis on different historical contexts. Ultimately, this book is indispensable for getting a unique, and very little talked about perspective, on the Spanish Revolution, and Spanish Civil War. Bookchin’s “the Spanish Anarchists: The Heroic Years” covers the period from 1868 to 1936—that is, from Giuseppi Fanelli’s introduction of the anarchist “Idea” to Madrid and Barcelona, to the beginnings of the military coup of 1936. It is a history of the formative years of the Anarchist movement, rather than a history of the Spanish Civil War. I don’t have the historical background to evaluate Bookchin’s conclusions; this book served as an introduction to this subject matter for me. 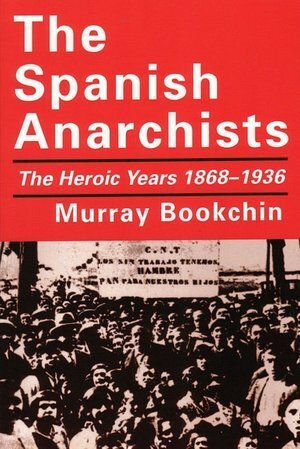 All I can d Bookchin’s “the Spanish Anarchists: The Heroic Years” covers the period from 1868 to 1936—that is, from Giuseppi Fanelli’s introduction of the anarchist “Idea” to Madrid and Barcelona, to the beginnings of the military coup of 1936. It is a history of the formative years of the Anarchist movement, rather than a history of the Spanish Civil War. I don’t have the historical background to evaluate Bookchin’s conclusions; this book served as an introduction to this subject matter for me. All I can do is muse on some of the themes that he touches on. Bookchin argues that Spanish anarchist movement which climaxed in the Spanish Civil War was the last great classical workers’ proletarian socialist movement, in the tradition that started from the June 1948 Parisian uprisings. In the prologue and final chapter, he notes that capitalism has changed greatly since the period stretching from the 1840s through 1930s: “In those years capital besieged a surprisingly preindustrial society, which could resist it with its rich neighborhood life, its towns, and villages. Today, that preindustrial society is increasingly giving way to a highly commodified market society—not merely a market economy—that has turned so much of the Western world into a giant supermarket with its subservient and suburbanized lifeways.” (p. 7) Accordingly, Bookchin argues that future Left movements will have a different character than those from the period this book treats. Bookchin emphasizes the spirit of experimentalism and deep humanism that animated the Spanish anarchist movement. He does not lionize this movement, and he does not hesitate to criticize its tactical mistakes and departures from ideals. Yet the anarchist movement, in Bookchin’s history, comes out much better than the more moderate socialists, whose authoritarian organizational forms led to their own eventual downfall. In that sense, the anarchists, often criticized for being utopians, appear more realistic than the authoritarian wing of the socialist movement. It’s interesting to compare Spain in this period to the U.S in (roughly) the same period. One of the major themes in Howard Zinn’s “A People’s History of the United States” is the great skill that American liberals have with co-opting radical movements, thus saving capitalism again and again. Zinn describes the Progressive movement in the early 20th century in this manner (as a reaction to socialist and labor activism), and the New Deal (as a reaction to U.S. labor militancy in the 1930s). Naomi Klein’s No Logo could be read as a description of how corporate America—with lifestyle branding-- has now completely co-opted the stirrings of rebellion against stultifying bourgois life in the 1950s and ‘60s. In contrast, Bookchin argues that the Spanish liberals largely abandoned the working class and peasants. This left a space for anarchism to grow in Spain. Above all, it is fascinating to read about how the “Idea” of anarchism inspired normal workers and peasants to build movements and institutions on their own, largely without the assistance of a vanguard of intellectuals, and largely without forming stultifying bureaucracies. In 1868, the "Idea" (as they called it) was planted in Spain by someone on a mission from Bakunin, one Fanelli who spoke no Spanish but whose passion was enough to convince the dedicated militants who began the anarchist movement in Spain, which would become the most significant in the world and help carry out the most far-reaching revolution of modern times. Today it seems like we inhabit a different planet. The days are long gone when a union could be formed, dedicated to the overthrow of capit In 1868, the "Idea" (as they called it) was planted in Spain by someone on a mission from Bakunin, one Fanelli who spoke no Spanish but whose passion was enough to convince the dedicated militants who began the anarchist movement in Spain, which would become the most significant in the world and help carry out the most far-reaching revolution of modern times. Today it seems like we inhabit a different planet. The days are long gone when a union could be formed, dedicated to the overthrow of capitalism, and grow to tens of thousands of members in a few months and organize violent general strikes in major cities. Bookchin's history seems well-balanced and obviously sympathetic, written as it was in the '60s and '70s before he became a crotchety anarchist-hater. He makes a general division between the mountain peasant anarchists of Andalucia, given to terrorism and jacqueries, and the industrial anarcho-syndicalists headquartered in Catalunya. The shadowy FAI with its organic affinity groups based on close personal friendships is of course covered, although here perhaps Bookchin's more moderate style shows through. He's not a big fan of the dramatic "cycle of insurrections" the FAI initiated in 1932-33, when pueblos would seize or blow up the town hall, raise the black flag, abolish money, and declare libertarian communism. Bookchin also finds some excuses for the CNT's blunder in 1936, when it allowed its members to vote for the left, although he also sees that this was the road that led the syndicalist union to open collaboration with the bourgeois state. The union that refused to accumulate strike funds because drawn-out strikes reduce workers' revolutionary fury in lightning strikes, was drawn down the path to co-optation. Recommends it for: skeptics of anarchist organization, those who still call statist "socialism" revolutionary. This book is not about the nearly forgotten simultaneous revolution and reaction that took place in the second half of 1936 in Spain. Instead, the book focuses on the even more buried account of the preceding 70 years of anarchist agitation and organization that lead to that standoff. Murray Bookchin meticulously reconstructs the organizations, ideologies, theories, movements, historical events, intellectuals and important persons of the time in a compelling history. What struck me the most about This book is not about the nearly forgotten simultaneous revolution and reaction that took place in the second half of 1936 in Spain. Instead, the book focuses on the even more buried account of the preceding 70 years of anarchist agitation and organization that lead to that standoff. Murray Bookchin meticulously reconstructs the organizations, ideologies, theories, movements, historical events, intellectuals and important persons of the time in a compelling history. What struck me the most about the Spanish Anarchists was the boldness of their actions. The Spanish Anarchists set out to polarize society on class lines through class warfare and strikes, destabilize the state apparatus through insurrection and mass non-participation, and then arm the people to resist the reaction of capitalists and state reactionaries. Entire villages simply declared "libertarian communism," took over land and factories, and started operating them in the interest of all until they were smashed by the reaction forces. And this before there was solidarity enough to spread this type of action across the country. This shows what is possible when oppressed people take it upon themselves to fight for their own freedom. I know little about the history of late nineteenth- and early twentieth-century Spain, to say nothing of anarchist movements in the country more specifically. Bookchin's account here certainly provided a good introduction to both of these, though I found his writing style here somewhat less exciting than in either Post-Scarcity Anarchism or The Ecology of Freedom; the radical criticality that I have found in these books--and admired Bookchin for--is certainly missing here. Overall, this is a f I know little about the history of late nineteenth- and early twentieth-century Spain, to say nothing of anarchist movements in the country more specifically. Bookchin's account here certainly provided a good introduction to both of these, though I found his writing style here somewhat less exciting than in either Post-Scarcity Anarchism or The Ecology of Freedom; the radical criticality that I have found in these books--and admired Bookchin for--is certainly missing here. Overall, this is a fascinating period of history reminiscent of the mid- to late- nineteenth and early-twentieth centuries in Russia--and a social milieu featuring much more passion and resistance (in my view) than is the case in much of our current reality. As others have mentioned, this book is the lead up to the Civil War, but contains nothing of the Spanish Revolution, only the background. The tensions between Anarchists and Socialists, as well as the other major players are looked at. As this is mostly a book on anarcho-syndicalists, the focus is on the working class, not Anarchist theory. A few things would've added to this book. Why on earth isn't there a map? Also, a glossary, especially since spanish words are introduced without translation. As others have mentioned, this book is the lead up to the Civil War, but contains nothing of the Spanish Revolution, only the background. The tensions between Anarchists and Socialists, as well as the other major players are looked at. As this is mostly a book on anarcho-syndicalists, the focus is on the working class, not Anarchist theory. A few things would've added to this book. Why on earth isn't there a map? Also, a glossary, especially since spanish words are introduced without translation. Also a reference list of the organizations and key individuals would've been nice. It's scholarly and well written-ish, but definitely dry. As such it took me quite long to finish, so it was quite hard to keep names and acronyms straight in my mind. 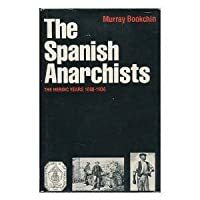 Bookchin's fantastic history of the Spanish anarchist movement BEFORE the Civil War. this is actually the best-written thing I've found of Bookchin's. if only he could have written this way for his theory pieces, like The Ecology of Freedom, which contains so many great ideas but written in such a jumbled mess. if you're curious about the Spanish Revolution/Civil War, this book is the necessary back-story. Wonderful history of Anarchism in Spain up to the beginning of the Civil War itself. As other reviewers elsewhere have pointed out, this is book that even people pissed off at Bookchin because of his pamphlet denouncing Lifestyle Anarchism like. For all those who maintain that Anarchism could never be sucessfully actualized. Can we say FAI bay area? Murray Bookchin was an American libertarian socialist author, orator, and philosopher. A pioneer in the ecology movement, Bookchin was the founder of the social ecology movement within anarchist, libertarian socialist and ecological thought. He was the author of two dozen books on politics, philosophy, history, and urban affairs as well as ecology. In the late 1990s he became disenchanted with the Murray Bookchin was an American libertarian socialist author, orator, and philosopher. A pioneer in the ecology movement, Bookchin was the founder of the social ecology movement within anarchist, libertarian socialist and ecological thought. He was the author of two dozen books on politics, philosophy, history, and urban affairs as well as ecology. In the late 1990s he became disenchanted with the strategy of political Anarchism and founded his own libertarian socialist ideology called Communalism. Bookchin was an anti-capitalist and vocal advocate of the decentralisation of society along ecological and democratic lines. His writings on libertarian municipalism, a theory of face-to-face, assembly democracy, had an influence on the Green movement and anti-capitalist direct action groups such as Reclaim the Streets.